I love my spiritual children as much as my own soul and even more. I have regenerated them through prayer and suffering. A note from the editors: We interviewed each of the three individuals whose testimonials appear in this issue of “Pray, Hope, and Don’t Worry.” They hold in common, a great esteem for their spiritual father, Padre Pio,and a generosity in sharing his message with others. They all currently reside in Southern California. When Charles Mandina reflects on his life, he feels that it was the Rosary that was initially instrumental in leading him to Padre Pio. After his mother passed away, Charles often found comfort in holding her Rosary. He did not know the prayers of the Rosary but having it with him seemed like a connection to his mother. It was at this time that someone gave him a book on Padre Pio, telling him it was a book he needed to read. He read the book with great interest and not long after he made a trip to San Giovanni Rotondo to see Padre Pio. The year was 1961. Charles attended Padre Pio’s Mass and was profoundly impressed. When he made another trip to San Giovanni Rotondo, Padre Pio asked him to stay on and assist him with the work. He became Padre Pio’s Italian/English translator, interpreting for the many English speaking pilgrims who came to see Padre Pio. Living inside the monastery he worked at Padre Pio’s side each day. He also assisted as one of his correspondence secretaries. One time Mary mentioned to Charles that Padre Pio walked at an angle, as if under the weight of a heavy cross. Charles had noticed it as well. He walked as if supporting a great weight. It was the walk of the Cyrenean, carrying the cross of Christ. Charles assisted at Padre Pio’s Mass and at the conclusion of the Mass he would take Padre Pio’s arm and help him down from the altar. Holding his arm, Charles could feel the suffering that was present in his body. It was always after the Mass that Charles noticed that Padre Pio walked at an angle. Charles noticed that when Padre Pio greeted visitors, or while conversing with the friars, or when engaged in other activities, he always kept his left hand hidden inside of his habit. Charles often wondered about this and one day discovered the reason. Padre Pio had a hook sewn inside of his habit and his left hand was holding on to his Rosary that was concealed from view. He was able to meet the many visitors, converse with friends and carry on a busy apostolate while at the same time praying the Rosary. Charles used to see the doctors from Padre Pio’s hospital, “The Home for the Relief of Suffering,” at the 5:00 am Mass every morning. After the Mass they would often seek advice from Padre Pio on especially difficult medical cases, asking whether it was advisable for certain patients to have surgery or not. Padre Pio never had to spend a long time pondering the questions but responded quickly. He advised the doctors according to the light given to him by God. Those who worked closely with Padre Pio all agreed that when his advice was followed, the outcome always proved to be the most beneficial for all concerned. Charles remembers Enrico Zeni, a chimney sweep by trade, who came to Mary Pyle asking for a job. Enrico’s face, hands, and clothing were generally always covered with a thick layer of soot and ashes. Mary asked Padre Pio if she should hire Enrico. “Yes, give him a job,” Padre Pio said. “His face may be dirty, but his soul is as white as snow.” Enrico became a very close friend of Padre Pio. It was Enrico who would open the little window in the monastery every evening so that Padre Pio could look out and wave to the large crowd assembled outside waiting to bid him goodnight. Charles remembers the time a doctor and an engineer, both from the Philippines, came to the monastery in hopes of meeting Padre Pio. Padre Pio saw the men from a distance and told Charles to tell them to go and put on long sleeve shirts or he would not see them. The two men objected. “It is the middle of summer and very hot,” they said. “We have just come from Rome and have been to the Vatican where everyone is wearing short sleeved shirts.” Although they were indignant, they did as they were told and came back wearing long sleeved shirts. Charles was present when Padre Pio walked in the room to greet the two men. They immediately fell to their knees and the room became permeated with an intense scent of perfume. The fragrance was so strong that their eyes began to water and their noses began to run. In a blessing, Padre Pio tapped the doctor on his head three times. The doctor was so overcome by the experience and by the great sense of spiritual power that was radiating from Padre Pio that Charles had to take his arm and help him up and to a nearby bench. Of the many graces Charles received while living and working in San Giovanni Rotondo that which he treasures the most is being present at Padre Pio’s Mass. The impact of his Mass cannot really be explained; it could only be experienced. People who had the good fortune to be present at his Mass were aware that something exceptional was taking place. It is impossible for any one who saw Padre Pio celebrate Mass even once to forget it. The experience was sufficient to produce a profound spiritual change in many people. Charles described Padre Pio’s face at the altar as “shining like the sun.” “He lived the Mass, he lived the crucifixion and the long hours in the confessional these were even more important than the miracles,” Charles said. Rocco Falatico has received many blessings in his life but the one that will always be uppermost in his mind is the visit he made to San Giovanni Rotondo in 1964 when he was 24 years old and the healing his son received through the intercession of Padre Pio. Rocco first noticed something amiss with two year-old Rocky when he began having difficulty walking. Tests from the doctor revealed that Rocky had a malignant brain tumor. Surgery was performed but the doctors were not able to remove all of the tumor. When Rocky was brought home from the hospital he was unable to walk and the doctors said there was a possibility that he would never walk again. Even though Rocky received thirty radiation treatments, the doctors could not offer any hope to the family. They estimated that little Rocky’s chance of recovery was one in one hundred thousand. Charles Mandina worked at the same company with Rocco, and having just come back from San Giovanni Rotondo, his enthusiasm for Padre Pio was contagious. He shared with Rocco many stories about Padre Pio, and Rocco was so impressed that he decided to take his son to San Giovanni Rotondo and make his request to Padre Pio in person. He would ask Padre Pio to pray for his son’s healing. For the first time in many months, Rocco began to have hope. When Rocco arrived in San Giovanni Rotondo, he entered the monastery church of “Our Lady of Grace” and saw Padre Pio at the altar, leading the afternoon Benediction service. Rocco noticed that Padre Pio’s face had a very noticeable spiritual radiance. He had never witnessed anything like that before. The next day Rocco was able to greet Padre Pio. 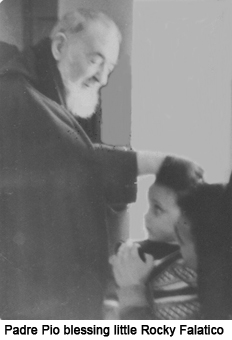 Padre Pio put his hand on Rocco’s head in a blessing and Rocco immediately fell to his knees. “It was like being in the presence of Christ,” Rocco said. 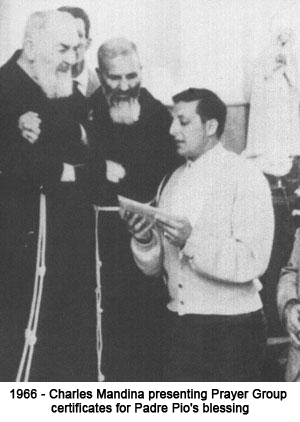 Face to face with Padre Pio, Rocco was unable to find the words to ask for prayers for his son. The following day Rocco was allowed to go into the sacristy to see Padre Pio. So great was the sense of God’s presence in Padre Pio, that Rocco felt overwhelmed; he could not speak. It was a replay of the previous day. He had made the long journey from California to San Giovanni Rotondo to ask Padre Pio to pray for his son, but once in his presence, he found himself unable to utter a word. Rocco and his son spent four days in San Giovanni Rotondo. When they returned to California, little Rocky’s health began to improve. He made a complete recovery from the cancer that was diagnosed as terminal and he has enjoyed good health in all the years since. In 1967, Carmelina Maruca and her two children made a trip to Italy to visit relatives. Before returning home to California, Carmelina and her children along with her sister, Antoinetta, and her brother-in-law, Mario, decided to visit San Giovanni Rotondo to attend Padre Pio’s Mass. Antoinetta and Mario lived in Salerno, Italy where Mario had a medical practice. They were all happy to be together as a family and visit Padre Pio’s monastery. While in San Giovanni Rotondo, Carmelina noticed the great devotion of the pilgrims to Padre Pio, but somehow she felt differently. “Padre Pio is not a saint,” Carmelina said to herself. “He is a priest, yes, but nothing more than that.” She could not believe otherwise. Padre Pio had been ill and so she and her family waited five days before he was able to celebrate Mass. They attended his Mass and afterward were told that he would be giving a blessing when he came out of the sacristy. About fifty people knelt down and waited outside the sacristy. Carmelina knelt down too but after a short time her knees began to hurt. “Why am I kneeling like this,” Carmelina said to herself. “This is not a holy person we are waiting to see. There are many Capuchins at this monastery and he is one among many. He should not be receiving so much notice. These pilgrims have a misguided devotion.” Carmelina rose to a standing position to be more comfortable. 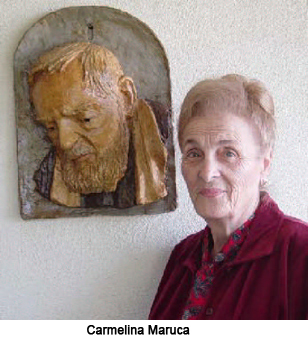 That very brief encounter with Padre Pio made a deep impression on Carmelina. Her attitude changed completely. The knowledge that he had read her heart confirmed to her mind his authenticity. Her devotion to him has increased through the years. Living in Salerno, Mario and Antoinetta were able to travel to San Giovanni occasionally, where Mario received spiritual direction from Padre Pio. Conversations with Padre Pio were always a source of great consolation to him. During one visit, Padre Pio said to Mario, “I see that there is suffering ahead for you, but with prayer, you will be all right. God will assist you.” Not long after, cancer was discovered in Mario’s shoulder. Very extensive surgery was performed which included the amputation of Mario’s arm. He was no longer able to practice as a surgeon and Antoinetta had to seek employment to support the family. Antoinetta passed away at the relatively early age of 55 years, leaving Mario a widower for many years. Remembering Padre Pio’s words, Mario turned to prayer and he received the strength he needed to fully surrender to God and to accept His will in his life. “The Prayer Groups, now scattered throughout the world and affiliated with the Home for the Relief of Suffering, are the advance guard of this city of charity… Christ himself is present every time the groups gather together for prayer…under the guidance of their pastors and spiritual directors. The spiritual significance of the Prayer Groups was further clarified by a grace that was given to one of Padre Pio’s spiritual daughters, Vittoria Ventrella. Vittoria, an elementary school teacher in San Giovanni Rotondo, had a vision in which she saw Heaven, filled with splendor. In the midst was a priest dressed in the richest of sacred vestments with pearls and precious gems. She saw that it was Padre Pio and his face became as dazzling as the sun, from which emanated innumerable rays of light, moving out into infinity. The rays were made up of myriads of small white and red roses. When Padre Pio died in 1968, there were approximately 700 Prayer Groups. Today there are more than 3,000 worldwide. Fr. Louis Solcia, CRSP, our spiritual director, asked Bishop Erba, a fellow classmate, to write about his work in the cause of Canonization of Padre Pio. This is a continuation from the last issue. “. . .To me, the reading of the four volumes of Padre Pio’s letters was a revelation. The letters disclose not only the ascetic heights Padre Pio attained in the spiritual life but also reveal his firmness as a spiritual director, and the depth of his thought, always abundantly nurtured by the word of God. Padre Pio’s sanctity shone forth when he encountered “the dark night of the soul” in his words, “when all is darkness around me and within me.” His life was an uninterrupted martyrdom, a miracle, a unique example. His witness gives hope to people and helps those who have lost their faith to reclaim it. 1. His endurance for half a century in the stifling rhythm of work and sacrifice, all borne with an outstanding faith. 2. His Christian fortitude and deep humility in bearing trials and persecutions without complaint. 3. The evangelistic fruits of his ministry, in particular the founding of the hospital “Home for the Relief of Suffering” and the establishment of the “Prayer Groups” now spread throughout the world.